Who is Jair Bolsonaro and Why is He More Dangerous Than Trump? The many reasons why Bolsonarismo stands alone when compared to its global far-right peers. 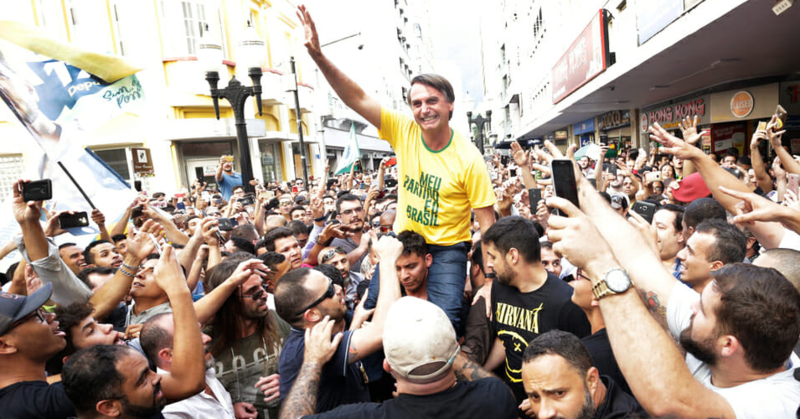 Bolsonaro is a seven-term congressman who surged into the popular consciousness as a hardline law-and-order figure with outsider credibility because of the swirling crises that have engulfed Brazil over the past five years. His racist, misogynist, homophobic outragesare numerous and well-known. Horrifying as these are, merely repeating them does not tell us everything about why Bolsonaro was such an unsuitable candidate — and now will be an unsuitable president. An editorial in the New York Times put Bolsonaro and Trump in the same league, but the U.S. is led by a politician who still enacts policy within the bounds of the law. Indeed, his idolization of violence and promises to greenlight extrajudicial killings brings him closer to the Philippines’ Rodrigo Duterte than to the current U.S. president. An editorial in the New York Times put Bolsonaro and Trump in the same league, but the U.S. is led by a politician who still enacts policy within the bounds of the law, in and through American institutions. The so-called “Trump of the Tropics” is a gross misnomer. Bolsonaro’s running mate, retired general Hamilton Mourão, suggests a Bolsonaro government would seek to redraft the 1988 Constitution, this time without any popular, representative input and stack the Supreme Court with additional justices. Attempts to strangle the constitution, such as these, put us in mind of other “managed democracies,” such as Vladimir Putin’s Russia or Recep Tayyip Erdoğan’s Turkey. “Constitutional dictatorship” is another term that could describe a post-Bolsonaro Brazil. But these comparisons only go so far. 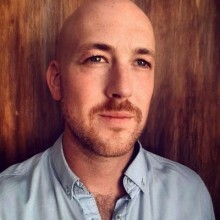 The widely discussed case for “Bolsonarism” being a form of neo-fascism hinges not just on bigotry, violence and authoritarianism, but on the interests that have rallied to him. The nucleus of his support — as per classic studies on fascism — is a middle class made up of small business owners and independent professionals, plus members of the police and armed forces. Though sections of the poor have also voted for him — mobilized by a worsening public security situation — the rich and educated support him in much larger proportions; this has been a decisive factor in this success so far. The upper-middle classes and the elite have long been animated by a barely coded class hatred that is fixated on the Workers Party (PT). This so-called “Antipetismo” fueled the move to impeach then-President Dilma Rousseff (a member of the Workers Party) on scant legal grounds. The parliamentary coup and break with democratic norms further delegitimized an already scandal-ridden political system. 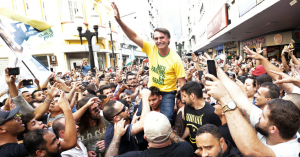 And the subsequent, disastrous rule of elite-backed Michel Temer spurred a radicalization of the right, with conservative voters abandoning their traditional parties in favor of the extremist Bolsonaro. Big business has flocked to the former army captain. Bolsonaro’s chief economic advisor, University of Chicago-educated Paulo Guedes, promises to privatize aggressively; the financial markets endorse this vision, as do many of its media representatives. Indeed, revelations in Brazil’s largest newspaper allege that many leading businesspeople illegally paid up to $3.2 million dollars each to spread fake news via WhatsApp, slandering Bolsonaro’s opponent. Though an investigation has been launched, the top electoral court failed to act. Instead, it banned a Workers Party campaign ad showing Bolsonaro’s support for torture and dictatorship. The campaign “can create, in public opinion, passionate states with the potential to incite violent behaviors,” the court ruled. Endorsement from the political and business elite makes comparisons to classical fascism evocative. As do his threats to machine gun Workers Party supporters, shoot activists in the landless and homeless workers movements and eventually classify these organizations as terrorist organizations. After all, it was this drive to crush the left that most animated fascism. Allied to sections of the military who want an increasing role in politics, Bolsonaro conjures up the sort of rule last seen in Augusto Pinochet’s Chile or interwar Europe. Political violence is already on the up. Worryingly, existing levels of violent crime could justify — and serve to mask — bloody repression. There were over 60,000 murders in Brazil last year. Police contribute to the bloodshed, killing thousands each year. Bolsonaro promised the special forces, whose emblem and cri de guerreis a skull, that their people would be included in the government, possibly suggesting a ministerial position for a special forces commander. Militias, composed largely of retired or off-duty police, are an increasing presence in Rio de Janeiro and beyond. They are active in at least 15 states and all practice extortion, threats and violence. They have been linked to the assassination of left-wing councilwoman Marielle France in March 2018. And then there are the empowered Bolsonaro supporters who have increasingly been carrying out intimidation, violence and even murder; swastikas have been daubed on walls and a Workers Party voter was stabbed to death. These aspects distance Bolsonarism from contemporary European right-wing populists. What unifies parties like the AfD in Germany, the Front National in France, the Sweden Democrats or the Italian Lega is that they all aim to politicize. For the past decades, Western societies have been ruled by “post-political” forms of management. Politicians justified themselves by saying: the experts are in power, we know best. Populism is a reaction that that declares: we, the people have different interests from you, the elite. In contrast, Bolsonarism signifies an attempt, by the rich and powerful, to sweep away all political division and to potentially do away with a democracy that includes those they feel should be excluded. Bolsonarism signifies an attempt, by the rich and powerful, to sweep away all political division and to potentially do away with a democracy that includes those they feel should be excluded. All of which is to say, Bolsonarismo stands alone when compared to its global far-right peers. And yet, if there is a unifying factor, it is that the new authoritarian right has gained prominence in the wake of the 2008 crisis. The reigning form of liberal democracy, triumphant after the Cold War, has become more difficult to sustain in turbulent times. The loss of legitimacy has not been capitalized on by the left, as one might have expected, but increasingly by the right. Traditional establishments have been complicit in this anti-democratic turn. Eager to bolster a system that many citizens support less and less, even moderate elites avail themselves of authoritarian and nationalist measures. In Brazil, the powerful and well-to-do reckon extreme-right Bolsonaro is a safer bet than the moderate, center-left Fernando Haddad. In France, centrists fret about Marine Le Pen, but it is the great free-market liberal hope, Emmanuel Macron, who effectively maintains a draconian permanent state of emergency. The European Union makes member-states vote again until they get the answer right. Obama deported more migrants and bombed at least as many countries as Trump. Former Trump advisor Steve Bannon is given credit for being a “mastermind” of this global authoritarian turn, but he is merely an opportunist, filling a vacuum left by elites’ negligence of democracy. From China to Europe to Brazil, the link between free market capitalism and democracy may be breaking. If so, genuine democrats face a fork in the road: cling to an increasingly anti-popular neoliberal order or defend democracy, warts and all.